The Center for Church Communication released a new print and digital book specifically for weary church communicators. 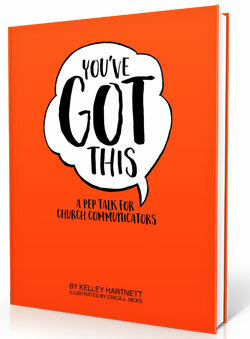 It’s called You’ve Got This: A Pep Talk for Church Communicators, written by Kelley Hartnett and illustrated by Erica J. Hicks. We came up with the initial idea and pitched the project. We served as developmental editor, helping with nearly every aspect of the editing, production, and marketing process.